Minister responsible for Marine Resources, the Honourable Eugene Hamilton describes the new Vessel Monitoring System. 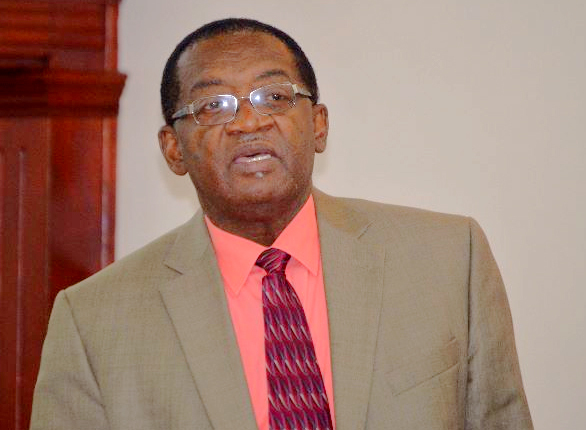 BASSETERRE, St. Kitts –- Three hundred Vessel Monitoring Systems (VMS) have been procured by the Government of National Unity to safeguard fishermen’s lives and vessels on both St. Kitts and Nevis according to Minister responsible for Marine Resources, the Honourable Eugene Hamilton. The VMS is a satellite-based monitoring system that at regular intervals records data on the location, course and speed of fishermen and their vessels. Minister Hamilton explained the VMS is now a standard tool to keep fishermen safe in St. Kitts and Nevis. Hamilton said St. Kitts and Nevis is the first nation in the region to introduce this system as a compulsory means of tracking all of the Federation’s fishing vessels. Signals come to the central point onshore at 15- to 20-minute intervals. The system tracks, monitors and understands the routes vessels have taken and the information is saved for future reference. “We monitor vessels in the territorial waters of St. Kitts and Nevis and in the exclusive economic zones,” said Hamilton. “We can extend monitoring up to 200 nautical miles. Each device costs US $300. “[This] government has decided to find US $300 for 300 fishermen so that each of them and all of them can have it on their vessels. This is a system that can tell authorities and the fishermen …where they are at sea at all times,” said Hamilton. In addition to the US $300 per unit, the government has underwritten the first three years of the annual licensing fee, which ranges between US $143,000 and US $156,250.